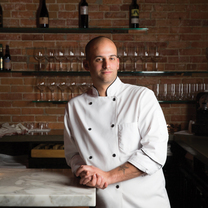 In mid-2015, Chef Niko Regas took over the kitchen at Emilitsa restaurant, replacing his father as executive chef. It’s a transition that was slow in coming – Niko trained at restaurants in York and in Minneapolis, including a stint at Jean-Georges Vongerichten’s Chambers Kitchen, but started out at the very bottom when he came to Emilitsa. "Second stop for date night The Black Birch!! Many thanks to the staff and @katherineharrismcintosh for an amazing night out!! Much love!!" "First stop for last night's date night The Wallingford Dram! Thank you @cgatch for the great drinks and congrats on your new adventures!!" "One year anniversary dinner at Ocean! Literally blown away!! Fantastic dinner and service!! Thank you @anajovic6 !!!!" "Today's lunch brought to you by @#boom"
"Can't forget about dessert!! Happy d_sansonetti"
"A much needed brunch @d_sansonetti"
Spiced duck breast with roasted carrots sauteed oyster mushrooms topped with mavrodaphne beurre blanc. "Spiced duck breast with roasted carrots sauteed oyster mushrooms topped with mavrodaphne beurre blanc." Dusted lightly with a smokey coriander flour, pan fried and served with Kalamata an Meyer lemon relish! "Um, yes please! Dusted lightly with a smokey coriander flour, pan fried and served with Kalamata an Meyer lemon relish! I might have to make this into a #portlandme"